Screening of Wisconsin Public Television's "University Place Presents: The Art of World War I Corporal Francis Webster." 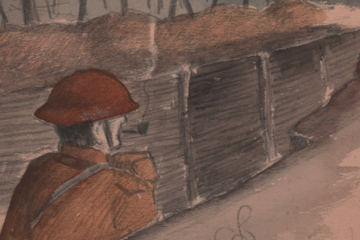 As the centennial of Armistice Day approaches, experience life in the trenches of World War I through the letters, diary, and artwork of a Midwestern soldier named Francis Webster. A recently recorded show of Wisconsin Public Television's University Place Presents explores Webster's artwork that was sent from the Western Front to the Home Front in the watershed event of the 20th century. Darrek Orwig, the book's editor who brought Corporal Webster's story to life, will be at the screening of the episode and available for book signings.